We are Sokoiko team. We offer interesting cycling tours around local areas in Hiroshima not mentioned in guide books! We have prepared routes through local neighbourhoods and visits to shops where you can meet and talk with local people. Please enjoy these great places with our tour! It was a fun and interesting tour! The guides developed a tour matching my interests and showed me a cute little cafe with lots of ukuleles and an impromptu concert! I would never have found this little cafe with yummy cake, friendly people and music! We also visited Hiroshima castle (where I could play the Taiko!) and the Atomic Bomb Dome. Interesting facts where offered along the way and recommendations for more sight seeing spots! I can definetly recommend this tour! Thank you, I had a great time! 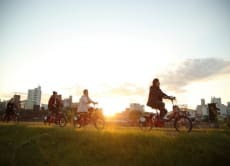 This was an awesome way to discover Hiroshima quick! The electrical bikes are easy to use And the guides personalise your tour. They ask you what you want to see, eat, do,... And they guide you all the way And tell you all about the history. I would absolutely reccomend this to anyone! The guides are locals from Hiroshima so they are able to show you things you wouldn't normally see And they help you whenever you need them to, for example when buying in local shops. The best way to see Hiroshima in my opinion!